Badminton strings are thin, high performing strings with thicknesses ranging from about 0.62 to 0.73 mm. Thicker strings are more durable, but many players prefer the feel of thinner strings. String tension is normally in the range of 80 to 160 N (18 to 36 lbf). Recreational players generally string at lower tensions than professionals, typically between 80 and 110 N (18 and 25 lbf). Professionals string between about 110 and 160 N (25 and 36 lbf). Some string manufacturers measure the thickness of their strings under tension so they are actually thicker than specified when slack. Ashaway Micropower is actually 0.7mm but Yonex BG-66 is about 0.72mm. It is often argued that high string tensions improve control, whereas low string tensions increase power. The arguments for this generally rely on crude mechanical reasoning, such as claiming that a lower tension string bed is more bouncy and therefore provides more power. This is in fact incorrect, for a higher string tension can cause the shuttle to slide off the racquet and hence make it harder to hit a shot accurately. An alternative view suggests that the optimum tension for power depends on the player the faster and more accurately a player can swing their racquet, the higher the tension for maximum power. Neither view has been subjected to a rigorous mechanical analysis, nor is there clear evidence in favour of one or the other. 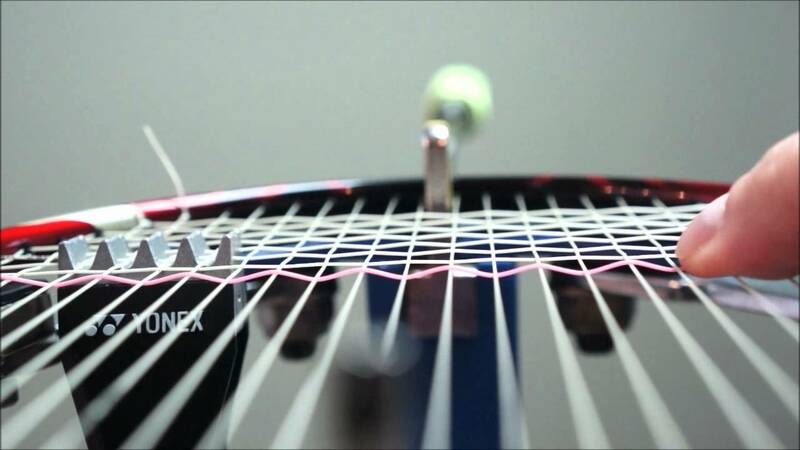 The most effective way for a player to find a good string tension is to experiment.